are designed to analyze source material, manage terminology and enable translators to compare the new text to the existing bilingual content over the LAN or WAN. CATs are a great aid not only to translators. They are used by project managers, file engineers, translators, proof readers and QA controllers to ensure primarily two things: 1. the ability to share knowledge and competence in a team and 2. consistency of terminology and style in every material sent by the same customer. No sentence needs to be translated, nor paid for twice! If entered on the translation memory, a CAT tool will automatically retrieve it for reuse when a close match is found. enables real-time exchange of content-related queries and responses of the customer, consultant, project manager and all translators involved in the project. QueryPartner users do not need to collect or re-send queries and answers, thus enabling instant, yet confidential, exchange of information regardless of the day, hour or time zone of the user. Thorough QueryPartner, all queries, announcements and responses become automatically available for the entire group. makes it possible to monitor the settings and progress of projects, their individual jobs and to manage last-minute changes within them. The system include supplier management, deliveries, deadlines and document circulation modules. 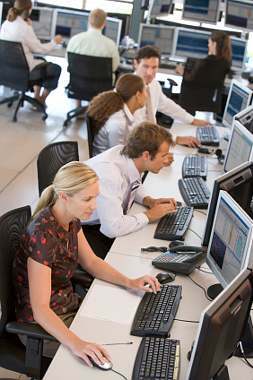 Through TOA24.com customers have access to online monitoring of both past and current services, quotations and queries. is a standard developed by the Localization Industry Standards Association. The standard works also as independent software which supports objective assessment of translation quality, based on clearly applied criteria. >For quality, the results achieved using the latest Xerox digital printing machines do not differ from traditional offset printing. What is more, in certain instances, they often go beyond the "old" technology. Since digital, as opposed to offset, printing technology does not need to use plates, the cost of printing is fixed per one copy. Now it is cost effective to print as few as one copy of a book, newspaper, brochure, leaflet or poster. Not only does the cost of digital printing take over the traditional methods; also the time to market shortens incredibly, thus offering customers a range of possibilities which so far have been unavailable, ineffective or required taking special measures.